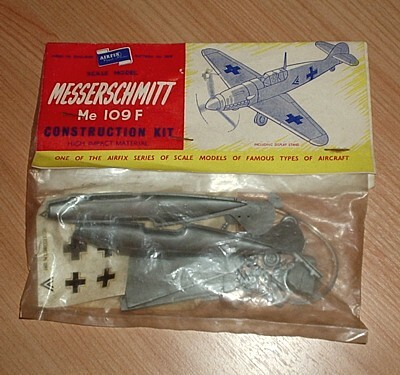 Many versions of the ME 109 were produced for the Luftwaffe, and this Airfix kit is based on the 'G' version, which was indroduced in 1942. With armament of two machine guns, and a cannon firing through the propeller spinner, this 400 miles per hour aircraft fought many gallant, though not always successful, battles with Spitfires and Hurricanes. Originally Me109F (1384) issued in 1956 then reissued as the Me109G-6 in 1965 onwards.